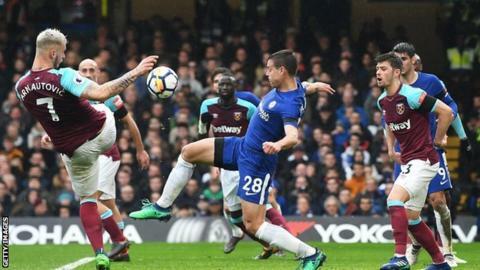 Winning the FA Cup will not be enough to "save" Chelsea's season, defender Cesar Azpilicueta said after a 1-1 draw with West Ham damaged his club's hopes of a top-four Premier League finish. Sunday's draw leaves the defending champions 10 points behind Liverpool and Tottenham in third and fourth. It means they are unlikely to qualify for the Champions League for the second time in three years. "We are further away than ever," Azpilicueta said. Former manager Jose Mourinho was sacked during the 2015-16 season, when the then champions finished 10th in the Premier League. Questions now abound about the future of current boss Antonio Conte, who has presided over a frustrating campaign after winning the title last year. With six games left, Chelsea can still mathematically reach the Champions League, although that would require a collapse from both Liverpool (who have five games remaining) and Tottenham (who have six games to play). Chelsea meet Southampton in the semi-finals of the FA Cup on 22 April, but even if they were to go on and win the competition, it would be scant consolation in the eyes of Azpilicueta. "The FA Cup is a massive trophy with a lot of history but it's not enough for us," the 28-year-old Spanish defender told BBC Match of the Day. "We will try to win it but the cup will not save our season." Azpilicueta, whose first-half goal on Sunday was cancelled out by Javier Hernandez's equaliser in the second half, added: "To get a draw at home in another London derby is really frustrating for all of us and all of the fans. We are not happy. "What matters is the score at the end, I am frustrated today, we should be able to win this game. "We controlled the game, we created enough chances to win but we struggled at the end and maybe they could have scored the winner. It's becoming harder and harder every game it goes on."